The article below appeared in the most recent issue of Competitive Intelligence Magazine. Here is the opening of the article. In today's world, where no one has time or attention, collecting and analyzing intelligence is only the first part of your CI work. The second part, which is not less important, is effectively communicating it to management, and for that, you need to learn how to tell a story. In my article "New Challenges and Threats to the Traditional CI Function" published in Competitive Intelligence - Spring 2018 I claimed that today's CI managers need to communicate better their findings and outputs to their bosses. They cannot - and should not - allow themselves to hide in their rooms, settling for submission of this report or that CI-related nugget in hope that management will take into consideration and actually do something about it. If you want to make real impact, I argued, you need to deliver the bottom line to the right people at the right time, and in order to do it properly, I suggested learning the art of message delivery from our fellow marketers. Where most intelligent people I know tend to be shy, modest and clever, most marketers I know are arrogant, ego-centered and...clever. They understand that you ought to be in the front line if you want the decision makers to notice you, and the best way to do it is simply by making noise. CI, by nature, is everything but noise. It is all about hard, Sisyphean work carried out by men of silence, whose typical actions are done quietly, sometimes remotely, from other buzzing organizational departments. I urged those people to explore new, different ways to deliver their messages to management and suggested to perfect their presentations by going visual. "It is the era of infographics," I claimed, "the era of visualization. How can you not capitalize on those great, efficient tools and implement them in your 1990's-look-like CI related products? Say No to boring, long reports and take advantage of those creative, free or semi-free platforms that will make a shining star out of you. Let them make you become more noticeable!" 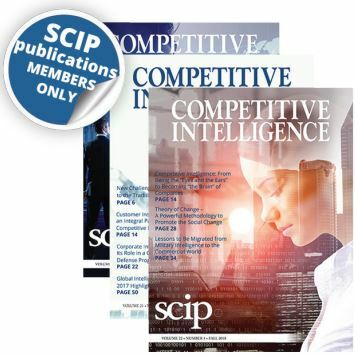 Member of SCIP Click here to read the remainder of the article. If you're not a member, click here to learn more about membership opportunities. Want to get your article published in one of our upcoming journals? Get your voice heard to the SCIP community.Click here for more information. Take a look at the line up of SCIP Boot Camps for your professional development. These structured interactive learning and immersive programs are designed to provide and then build on the skills needed for success in the intelligence discipline. They deliver an interactive, tangible experience that fosters collaboration, sharing of experiences and knowledge and cooperative learning. Our boot camps maximize learning potential for participants by emphasizing one-on-one engagement with our outstanding "expert instructors".